Authors: C. Walsh et al. Authors: G. van der Plas et al. Status: Accepted by A & A. How planets form is one of the hot topics in current astrophysical research. The vast detection of exoplanets indicates that it must be a frequent process, and protoplanetary disks – by-product of the star formation process – are believed to be the birthsites of planets. Observations with ALMA resolve protoplanetary disks with a precision never seen before, and thus give constraints on how planets form. For example, astronomers observe different types of protoplanetary disks that most likely reflect the different evolutionary stages of disks, and subsequently of the planet formation process. The commonly accepted idea is that protoplanetary disks evolve from an initially more or less continuous distribution of material to a state of planetary systems. Astronomers typically distinguish between two components in disks, gas and dust, where the gas component is on average 100x more massive than the dust component. (There is a continuous transition between dust and gas, but generally you can say that gas consists of individual atoms and molecules, while dust refers to larger molecule chains.) The standard scenario is one where tiny dust particles grow and eventually build-up planets. Part of the gas may accrete onto massive planets, and the remaining dust and gas are removed from the disk either through accretion onto the star or is blown away. Transitional disk directly related to planet formation? A particularly interesting type of protoplanetary disks are transitional disks, which are disks that show depletion of material at small distances from the star, while the outer parts still contain a significant amount of material. Depending on their subtle features, transitional disks may either be signs of a later cleaning mechanism via photoevaporation from the radiation of the central star or an earlier planet formation process. However, some disks only show dust depletion but not gas depletion in the inner region of the disk. Therefore, transition disks cannot be results of photoevaporation, and instead may be associated with planet formation. The authors of both featured papers investigate a transitional disk with ALMA, namely the disk around the 2.5 solar mass Herbig Ae/Be star HD 97048 with ALMA. Both groups image the disk in ~mm wavelength (that means the dust) and trace the emission of the J=3-2 molecular line of CO (that means the gas). Additional to that, van der Plas et al. also trace the emission of the J=1-0 molecular line of CO and the J=4-3 line of HCO+ (two further constraints on the gas content). They find that the data can best be described by a disk that is depleted in large (that means mm-sized) dust grains within the inner 45 AU and further depletion in the dust distribution around 100 AU and probably at 250 AU (see the the image in Figure 1 or minima and bumps in Figure 2). Such ring-like structures have been observed previously in a young disk around HL Tau (<1 Myr), as well as an old disk around TW Hydrae (~10 Myr). Given the age of HD97048 is about 2 to 3 Myr, further suggests that gaps and rings are omnipresent features in protoplanetary disks. The disk is also significantly flared, which means that the vertical height of the disk increases more than linearly with increasing radius. Apart from that, the dusty disk extends to about 350 AU, whereas the gaseous disk is more than twice as large. Both groups interpret these results as a sign of radial drift of dust particles due to the gas drag inside the disk. Radial drift of dust particles occurs because the gas moves slightly slower in a disk due to pressure, hence the dust particles feel a headwind inside the disk. 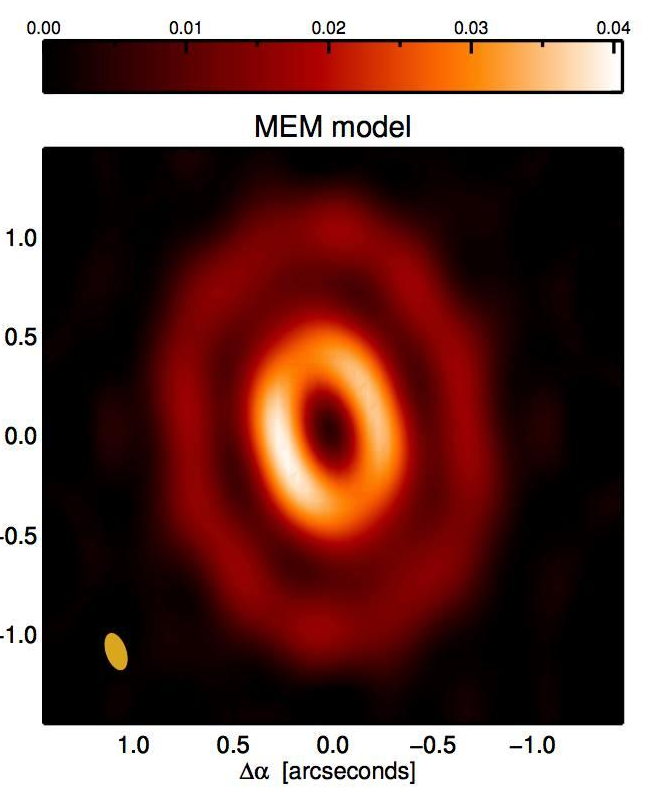 Also, the inner cavity of the dusty disk (as indicated by the inner hole in Figure 1 or the drop in intensity in Figure 2) extends further out than for the gas (~45 AU to ~13 AU). Together with the observation of a radial inward motion of HCO+ inside the dust cavity, the larger dust cavity may be caused by an extra body of 0.7 Jupiter mass located in an orbit slightly larger than Saturn’s. However, it is fair to say that the authors cannot rule out a different mechanism than an inner planet. In summary, observations of the dusty transition disk around HD97048 give further insight on what happen between the formation of protoplanetary disks and the stage of planetary systems. Nevertheless, future observations with better resolution to resolve the gap properly as well as more elaborate models of planet formation are required to eventually answer the question.